Flowers red, large: I-IV; foliage dark green; habit bushy; 18in × 24in. Pink (H8) flowers darkening to heliotrope with heliotrope (H12) sepals, XII–IV; mid-green foliage; height 46–60cm; spread 46–60cm. Seedling; raised by J. W. Porter (Carryduff, County Down, Northern Ireland) before 1967; introduced by Hilliers (Winchester, Hampshire, England) before 1973. Named after one of J. W. Porter's friends and one-time Superintendent of the Belfast Botanic Garden Park. Large lilac-pink (H11) flowers, X–III; mid-green foliage; height 26–30cm; open habit; spread 46–60cm. Not as hardy as most Darley Dale heaths. A sport from 'Darley Dale', found at Renens, Switzerland, by Henri Brégeon (Vand, Switzerland) in 1980. Named after the finder's wife, or second daughter (Yearbook 1991). Large (to 6mm long) pink (H8) flowers, XI–III, with deep lilac pink (H11) sepals; mid-green foliage; strong but compact habit; height 35cm; spread 60cm. Named after one of his sons, Richard (his nickname is Bert). ® E.2007:12 registered in 2007 by Peter Bingham, Gedney, Lincolnshire, UK. Lilac (H4) flowers I–V; mid-green foliage, young shoots green; height 26–30cm; spread 46–60cm. A seedling found growing in his garden in Ernst, Netherlands, by J. Dogger, c. 1982. Named after the nearby town. Lilac-pink (H11) flowers, I–V; mid-green foliage; broad upright habit with occasional very long shoots; height 31–45cm; spread 61–75cm. Seedling of uncertain origin; included as Erica carnea in catalogues of Georg Arends (Wuppertal, Germany) in 1929, and of Kaiser & Siebert (Germany) in 1932. Named from erectus = erect. Pink (H8) flowers darkening to heliotrope (H12), XI–V; mid-green foliage, the young shoots tipped red fading to pink and cream; bushy; height 26–30cm; spread 61–75cm. Seedling; found by C. D. Eason on Maxwell & Beale's nursery (Broadstone, Dorset, England); introduced by Maxwell & Beale in 1935. Named after William George Rendall Eason, son of C. D. Eason (Yearbook of the Heather Society 4 (1): 33 (1993)). George Rendall was also the name of the boy's maternal grandfather. Pink (H8) flowers becoming heliotrope (H12), XI–V; light green foliage, the young shoots with cream tips in spring; height 26–30cm; spread 75–100cm. Sport on Erica x darleyensis 'Darley Dale', or seedling; raised by J. H. Brummage (Heathwoods Nursery, Taverham, near Norwich, Norfolk, England). Named after a locality near Brummage's nursery (that being Ghost Hill, or Ghosthill). Flowers single; corolla salmon pink; calyx cream; in sturdy upright flower spikes: XI-V; foliage mid-green; habit compact, spreading, floriferous. Differs from other cultivars in its distinct salmon pink flowers, early and long flowering; its habit makes it excellent for containers. Deliberately raised hybrid; a selection by David Wilson from the cross made by him in 1998 between Erica carnea 'Treasure Trove' and Erica erigena Irish Dusk'; first flowered 2000, selected 2002. Registered on 29 September 2003 by David Wilson. 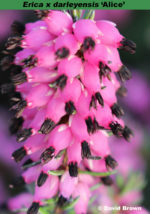 Named by David Small; name derived from the first words in the epithets of the parent cultivars, Erica erigena 'Irish Dusk' and Erica carnea 'Treasure Trove'. Deep pink (H8) flowers, darkening to heliotrope (H12), XII–IV; mid-green foliage, the young shoots tipped pink and cream in spring; compact; height 31–45cm; spread 46–60cm. Given to Mrs Louis (Moira) Reid (Liskeard, Cornwall, England) by James Smith (Darley Dale, Derbyshire), and subsequently named and introduced by Treseder's Nurseries (Truro, Cornwall) before 1966. Named after James Smith, owner of the Darley Dale Nursery. Large magenta (H14) flowers, I–IV; dark bronze-green foliage; broad upright habit; height 45cm; spread 60cm. Sport from Erica x darleyensis 'Kramers Rote' (fide Kurt Kramer). Clone ERI 21; submitted for plant breeders' rights in Germany by Ludger Cattelaens (Kalkar, Germany) on 17 December 1998; re-named 'Lena' whilst on test; granted 17 May 2000. Alleged to be a tetraploid. Lilac (H4) flowers, XII–V; mid-green foliage, the young shoots have cream tips in spring; neat rounded habit; height 16–20cm; spread 31–45cm. Seedling; raised by J. W. Porter (Carryduff, County Down, Northern Ireland) before 1963; selected, named and introduced by John F. Letts (Foxhollow, Windlesham, Surrey, England) in 1970. Named after a sister of James Walker Porter (see also 'Jenny Porter'); the name was suggested by Mrs Eileen Porter. Flowers corolla magenta (H14), 6mm long x 3mm diameter; calyx magenta (H14), 4mm long; anthers brown; I -IV(V); foliage: mid to dark green; young growth cream; habit: vigorous plant, spreading to 0.6m, to 0.4m tall, after 10 years (not pruned). Similar to ‘Kramers Rote’ but with brighter flowers and cream new growth. 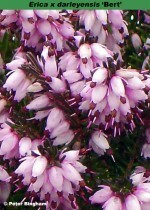 pollen parent not recorded but probably Erica carnea ‘Myretoun Ruby’. Named by Barry Sellers after his late father. ® E.2016:03 registered by Barry Sellers, Norbury, England. Deep pink flowers, XII–IV; mid-green foliage; height 31–45cm; spread 46–60cm. 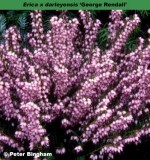 Raised by Mrs Anne Parris (Usk, Monmouthshire, Wales) in 1978; an experiment designed to prove the parentage of this hybrid from an un-named Erica erigena seedling pollinated by Erica carnea 'Myretoun Ruby'; introduced by Mrs B. Evans (Ridgway Heather Nursery, Craven Arms, Shropshire, England). Named after Mrs Anne Parris (d. 1996; Bulletin of The Heather Society 5 (6): 3 (1995)). Note the name does have a final s after the apostrophe under ICNCP rules. Corolla rose-pink; calyx rose-pink; X-I; foliage dark green; habit compact, bushy; after 3 years 15cm tall, 25cm across. Chance seedling at Forest Edge Nurseries, in found by David Edge in 2003; believed to be a cross between Erica carnea 'Treasure Trove' and Erica erigena 'Irish Dusk'. Registered on 20 January 2005, by David Edge, Forest Edge Nurseries, Woodlands, Wimborne, Dorset BH21 8LJ. Named from a large chunk of rock that goes around Saturn at an odd angle. Flowers: corolla heliotrope (H12, RHS 73B), to 6mm long, 3mm across, calyx shell pink (H16), 3mm long; anthers black, style end cerise (H6); XII-V; foliage: mid-green, with bright green young growth; habit broad, bushy: after 3 year in 40cm tall; spread 40cm (pruned). Flowers bigger than ‘Winter Treasure’. Deliberately raised seedling (pollen parent 94-5-39, seed parent 94-5-35) produced by Kurt Kramer, in 2007; selected in 2011. ® E.2016:06 Registered on 18th February 2016 by Kurt Kramer, Edewecht, Germany. At time of registration as 'Pink Magic' (E.2013.03) stated to be a tetrapod. Flowers single, 10mm x 5mm; corolla lilac pink (Hll), calyx heliotrope (H12); XII-V; foliage very dark green with red tips in spring; habit neat, low, spreading mound; height 25mm; spread 50mm. Sport on 'W. G. Pine', found in 1997 by Ken Hutchins at Oregon Rhododendrons, Corvalis, USA. ® E.2008:02 registered on 24 January 2008 by K. Hutchins, Mossyrock, WA, USA. Named from a play on the word polyploid (having a chromosone number more than double the basic or haploid number); "probably a tertraploid but not tested". Magenta (H14) flowers, I–IV; dark bronze-green and white variegated foliage; height 30cm; spread 50cm. A sport of 'Kramers Rote' but with variegated green and white foliage especially in early summer. Not as vigorous as its parent, but one of the true variegated heathers; applied for pbr in January 2002 to CPVO; A. J. de Jong, Klazienaveen, Netherlands. Flowers, corolla and sepals magenta (H14 RHS 68A); XI-IV; foliage dark green; height 25cm; spread 25cm after 3 years. Seedling raised by Kurt Kramer in 2006. ® E.2009:01 registered on 11 March 2009 by Kurt Kramer, Edewecht, Germany. Flowers mauve to heliotrope (H2 / H12) in spikes to 8cm long, corolla urn-shaped, to 7mm long, maximum width 5mm; calyx dark mauve, to 4mm long; anthers very dark red, fully emergent; II-IV; foliage dark green above, pale green below, to 9mm long, linear; habit upright; height to 45cm tall; spread 35cm after 5 years (not pruned). Differs from ‘Kramers Rote’, more upright habit and more “red”. Deliberately raised seedling, cross made by Johannes van Leuven in February 2008; selected February 2010; EU-Sortenschutz SR-2 (Torero). Named after a bullfighter. registered on 6th April 2015 by Johannes van Leuven, Geldern, Germany. ® E.2015:02. registered on 6th April 2015 by Johannes van Leuven, Geldern, Germany. Flowers pink (H8), darkening to heliotrope (H12), XII–IV; dark green foliage, young shoots tipped red in spring; broad habit; height 16–20cm; spread 46–60cm. This was the first hybrid produced by J. W. Porter (Carryduff, County Down, Northern Ireland) in 1943. Not as tall and more floriferous than 'Furzey' or 'J. W. Porter'. Large rose flowers, XI–IV; dark green foliage; broad upright habit. A sport from 'Spring Surprise' found by Johannes van Leuven (Ilmenweg 39, D- 47608 Geldern, Germany), in November 2004. Clone ERI90 submitted for plant breeder's rights on 29 August 2005 to Bundessortenamt Hannover. The original denomination implied that it is a tetraploid but this was not mentioned on the registration form. Registered in December 2005 by Kurt Krammer.